We follow original and exclusive routes with flexible duration, starting from 3 nights up to 14 nights cruising. Even our shorter routes visit some of the most impressive and out-of-the-way visitor sites! Our naturalist cruise programs include a wide range of activities as guided hikes, inflatable dinghy-rides, snorkelling, as well as interesting visits to giant tortoise breeding projects, interpretive botanic trails and visitor’s centres. You will be impressed observing, photographing and filming the incredibly tame and prosperous Galapagos wildlife from different perspectives. You will be closer to nature than ever before! The rich and spectacular Galapagos wildlife is the most important aspect of every naturalist cruise, but not the single and only factor that paints holiday memories for the rest of your life. M/Y San Jose contributes truly to a comfortable and pleasant stay as well. We follow fascinating routes accompanied by an excellent naturalist guide and including time to unwind from the well-filled excursion program. Our chef will pamper you with a rich breakfast buffet, snacks, an exquisite warm lunch and served dinner in buffet style as well. -Route B4 (– north-east): Our shortest route gets the most out of just four days Galapagos. It combines the exclusive bird-island of Genovesa (with red-footed boobies and the short-eared owl) with the popular highlights of South Plaza and Santa Fe (both with land iguanas and giant cactus trees). 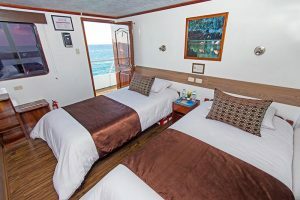 -Route B5 (– south): Our 4 nights southern itinerary gives a quite complete overview of Galapagos. Moreover this route combines two of the most popular snorkel sites of Galapagos: Champion Islet and Bartolome, where you might snorkel with fishing penguins. 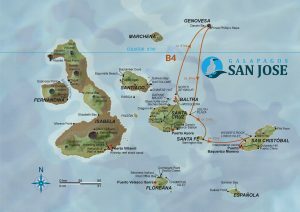 -Route B (–– east): Our 7 nights eastern route visits most popular sites of Galapagos and exclusive Genovesa. This varied route combines the overwhelming sea bird colonies of Genovesa and Española with highly appreciated South Plaza. -Route A (– west): Our 7 nights western route primarily explores the remote and exclusive western islands of Isabela and pristine Fernandina, which are both just recently born out of fire. After rounding Isabela clockwise we will return to the heart of the archipelago for several landings at Santiago and its satellite islets, before finishing on and around Santa Cruz and North Seymour. This cruise itinerary includes two nights of quiet rest at fairly calm anchorage-sites.